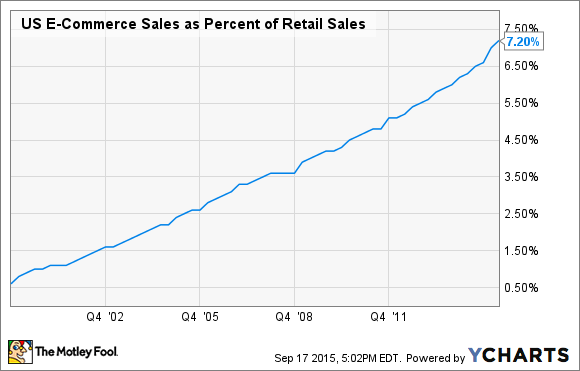 The retail business is becoming increasingly challenging and competitive. For this reason, you need to pick the winning industry players when investing in the sector. Being a brick-and-mortar retailer is notoriously tough nowadays. The industry has always been savagely competitive, and the rise of online commerce is making things even more difficult for companies in the sector. For this reason, when investing in retail, investors need to make sure to pick the right industry players, meaning companies that are strong enough to grow and thrive under such a challenging competitive landscape. Fortunately for investors, our contributors have identified three different strategies implemented by top retail players that continue driving solid performance in a tough environment. Andres Cardenal: It's not about online vs. brick-and-mortar sales anymore. The best retailers are approaching the industry with an omnichannel mentality -- meaning that different sales channels need to be intrinsically interconnected and work smoothly with each other. The differences between online, mobile, and physical stores are blurring. Customers demand a seamless shopping experience across multiple channels, and the top industry retailers are focused on delivering what customers want. For example, the mobile app needs to match the responsive design of the website, and the website should reflect the look and feel inside the store. Macy's (NYSE:M) is doing an amazing job at adapting to the omnichannel revolution. The company has recently announced the closure of 35 to 40 underperforming physical stores in early 2016. However, this does not mean that Macy's is moving away from brick-and-mortar toward operating solely online. On the contrary, physical stores are still a key component of Macy's omnichannel strategy. The stores provide a unique form of interaction with customers, and all of Macy's locations currently serve as fulfillment centers for online orders. Customers can also pick up the merchandise they ordered online or via mobile devices at stores locations. Macy's even defines itself as an omnichannel company. Its vision statement says, "Macy's, is a premier national omnichannel retailer with iconic brands that serve customers through outstanding stores and dynamic online sites. Both Macy's and Bloomingdale's are known worldwide, and each has its own unique identity and customer focus. Bluemercury is a beauty business focused on specialty stores." Tim Green: One advantage that brick-and-mortar retailers have always had over online retailers is the ability of customers to get their hands on products immediately instead of waiting two days or longer for packages to arrive. With Amazon investing in same-day delivery and grocery delivery in various cities, retailers are now at risk of losing that edge. A variety of delivery start-ups have popped up in recent years, and retailers are increasingly partnering with them in order to fight back. Whole Foods (NASDAQ:WFM) announced a partnership with grocery delivery startup Instacart last year, allowing customers to place orders online and have them delivered within one hour. The partnership also allows customers to place an order and pick it up at the store, with the order being assembled by Instacart employees. This allows the customer to avoid the hassle of grocery shopping altogether, or simply the trouble of walking around a crowded Whole Foods store. More recently, Walgreens (NASDAQ:WBA) has partnered with on-demand startup Postmates to offer same-day delivery from 600 Walgreens stores across the country. The partnership allows the Postmates app to feature a Walgreens storefront, and the companies will work together to ensure that hundreds of the most popular items are up-to-date in the app. Instead of building out their own infrastructures for same-day delivery, an expensive and risky endeavor, retailers are turning to these delivery startups to give customers more convenient access to their products. Giving customers more choices and a frictionless shopping experience is a sure-fire way to keep them coming back. Steve Symington: Making consumers pay for the privilege of walking through the door might not seem particularly "innovative", especially given some of the high-tech shopping solutions retailers employ nowadays, including everything from interactive mirrors, mobile apps, and seamless digital payment systems. But I think investors tend to forget how stores like Costco Wholesale (NASDAQ:COST) effectively broke the rules of retail by embracing a membership model in the first place. By combining its membership fees -- which comprised $584 million of last quarter's $26.1 billion in total revenue -- with its differentiated barebones warehouse approach and habit of stocking very few high-volume items to be sold in bulk, Costco has been able to consistently keep its prices low and customer loyalty high, despite the meteoric growth of online retailers. Costco has impressively maintained at least 6% comparable-store sales growth for each of its past five fiscal years despite the fact online sales still comprise only 3% of total revenue. That's especially amazing considering e-commerce sales simultaneously almost doubled their share of overall retail revenue to higher than 7% during the same period. This is hardly a universal solution for struggling brick-and-mortar retailers to right their respective ships. More often than not, embracing an omnichannel approach, as Andres describes, is the most appropriate way forward for those looking for an innovative way to court consumers. This underscores just how well Costco has executed its unique membership model to stay relevant in today's increasingly competitive retail world.